Not sure if you’ve heard the news, but Piperlime is reportedly shutting it’s doors at the end of Q1. Considering the parent company (GAP), I’m not totally surprised. Piperlime is the only brand under GAP’s umbrella where they have to source from other designers as opposed to producing the product in-house. GAP’s sweet spot is more budget-friendly customers anyway, so it’s not surprising that Piperlime (which targets a more affluent audience) wouldn’t resonate as well with their current follower base. While I’m sad to see them go, it means they’ll be having AMAZING sales and steals before the end. Enjoy an extra 30% off all sale items, and an additional 50% off final sale when you enter code SALEONSALE at checkout! Don’t miss this chance to pick up gorgeous spring styles like this floral Marchesa Voyage blouse (also adore the off-the-shoulder dress style! ), this pink lace Rebecca Taylor number, and the perfect lighter wash jeans. Sale ends tomorrow! We may have just had a “snow” day in Dallas yesterday, but my eye is dead set on spring. There are sooooo many cute pieces I’d love to get my hands on this season. A few items that are hanging out in my shopping cart right now include these Tibi mules, this Haute Hippie trench dress (chic! ), Chloe’s Drew bag (hoping it comes out in other shades soon! ), and these simple flat slip-ons from J.Crew. Tory Burch also has a ton of must-have new clothing arrivals… Specifically this tweed tunic + short combo, this crochet and fringe skirt, and this pretty printed one-piece. Love the Tory Burch sandals so perfect for summer. Sad that they are going out of business, but hey, I’ll take the sales :) Loving all the picks Merritt! Love your picks Merritt and this color palette has me craving spring more than ever! I’m so afraid to get my hopes up here in Boston though, it seems like we’re never NOT going to have snow again. Eek! I missed that bit of news! That now explains all of the sale emails I have been getting from them. I’m going to have to set aside a chunk of time to peruse the site! Pretty much love everything you selected. The Chloe ‘Drew’ bag is SO in right now, all the ‘it’ girls have one! Bummer to hear about Piperlime but thumbs up for the sales! This Edit makes me excited for Spring and warmer temps. Adore the salmon hue. I am obsessed with those Tibi wedges! They are pretty much perfect with that TB shift too! This is possibly one of the most fun style boards I’ve ever seen! Love all of the colors and textures. Makes me soooo excited for spring and summer! dreaming about that valentino and those TB flats! love this peachy inspiration. A little sad to see Piperlime close it’s doors – it was a great place to pickup multiple different pieces, often on sale, but your points are totally right, just not the market. I need spring now. That Chloe bag is on my wishlist. C’mon Texas bring us back that 70 degree weather for real! Disappointed about Piperlime – I really like their selection. So many pretty pieces here! I especially love the Tory Burch dress and Dior nail color! That TB shift dress and those flat sandals! NEEEEED! You have the best edits! Love all of these bright colors! I love that coral sweater and those lace linen shorts! I wish spring would hurry up and get here already! So sad. I really liked their collection and picks :/ Anyway, the sale is really good! Love the refreshing color of the nail polish! I’m sad to see them go, but happy about the deals. 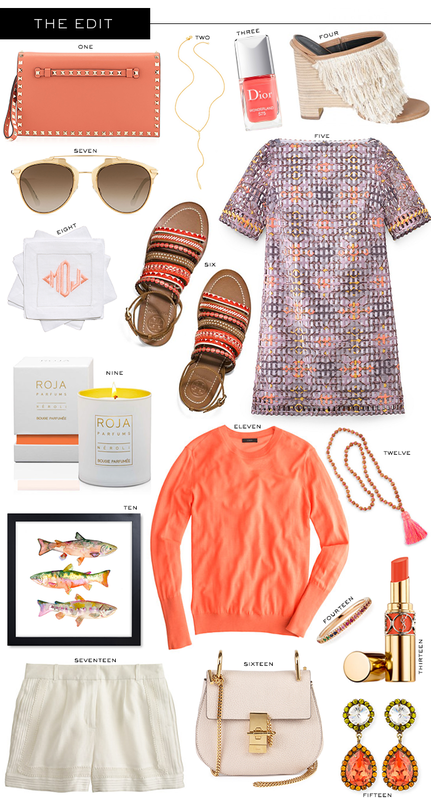 These picks are great, especially since I like coral and orange for Spring and Summer. Great picks as usual! Stay warm! love the sunnies in gold too!! Love that Dior nail polish color! Great picks. So sad about the end of Piperlime… I am excited about the sales though! Love all of these picks. I can’t wait for warmer weather. Such fun picks! So bright and fresh!